Despite VP Cheney’s proclivity for secrecy and his ability to pull it off, for the rest of us, we have entered into the age of no privacy. Comments at a public hearing, letters to the editor, references in a news item (even the police blotter), minutes of a meeting, newsletters (church or otherwise) will eventually be posted to the Internet. Just to prove this-Google your name. While you are at it, check ZoomInfo, a site that employs web crawlers to search for information on millions of people. This general loss of privacy has not been uniform. Those with power, like our Vice President, have powerful tools to maintain their privacy, often at public expense. We should insist on uniform and open standards across all spectra of our society. We can lament the loss of privacy but there is a positive side. When we are aware that our words and actions will eventually be posted for all to read and see, then maybe we will think twice before saying or doing something that is either unethical or illegal. This may become a mild deterrent to the psychopaths among us who prey on ignorance and operate within the shadows of people’s lives. New generations may not be as enamored with modesty as past generations. With the pornofication of society, postings of intimate pictures to U-Tube by a disgruntled lover may not be disconcerting. 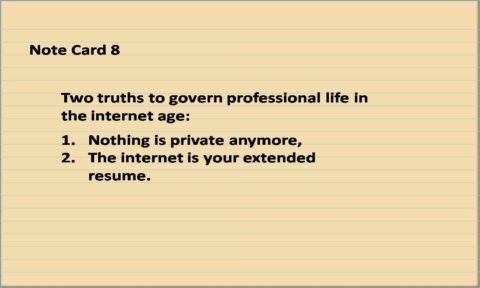 But if you think of the Internet as an extended resume, then a U-Tube posting becomes part of one’s reputation and may have significant costs in the market place. I recently talked to a headhunter about placing our students. He affirmed that he Googles every candidate that he tries to place. You can bet that part of the reference check that every employer now does is a Google search on final applicants. What are the chances that an applicant will get an offer if negative information shows up on the search? The age of no privacy may, ironically, restore the value of having a good reputation. Attention to one’s reputation may help direct and govern behavior, which can’t be all bad.